Assess the cost of quality – and counter those disastrous ‘cost savings’. The Journal of the Institution of Engineering Designers. Date: Sept/Oct 2010 updated March 2017. How often have you been in a meeting to be told about a ‘cost reduction’ and groaned? You know what I mean – often it’s the purchasing guy (and all he’s doing is chasing the material cost saving targets he’s been given) – but he’s discussed your component with the supplier and they’re both quite sure they don’t have to do that operation that adds so much to the cost. You just know the operation is essential. You tell them we tried doing without it a few years back and it didn’t work. Ah, but technology moves so quickly doesn’t it? And why are you standing in the way of a 5% cost saving? Because we have to stay competitive, or there just won’t be a job designing this stuff any more. And it’s up to you in engineering to solve any little problems along the way, and to just make sure the drawings spell out what we want. The problem is that you are arguing from your considerable engineering experience, but where’s your measure and target for that? And even if you had one, any metric you have won’t stand against the hard ‘fact’ of a 5% cost reduction – it sounds even better in pence or cents too. So the only way you can fight back is with an alternative cost figure – one that includes the cost of quality – here meaning the cost of putting things right when they all go horribly wrong. If you can estimate the quality cost of the existing design and the new proposal, it could well be that an apparent 5% saving is more likely to be a 15% on cost! But how can an engineer argue the cost with the commercial people? What do we know about quality costs? They allow for that somehow in the overheads don’t they? Well, yes they do, but let’s take a look at that ‘somehow’. It is not that hard to get a list of all the material that has been signed off as scrap and work out how much it cost. It’s a little more difficult to capture the time spent re-working parts and re-testing them, but that can be done to find a cost of rework. But then what happens is that the total is averaged out over assembly time, or some other basis for overheads, and these costs are just shared out, so we are told that scrap and rework are 2% of assembly cost, say. More sophisticated organisations will recognise their quality department as elements of a higher quality cost, but few will even want to consider all that overspend in engineering as quality cost. Surprising isn’t it how they forget that while you were sorting out that production issue last year you weren’t actually getting much done on your own project? The flaw in the costing algorithm is that step of averaging quality costs. It works for allocating overheads, but a moment’s thought shows it is no use at all for individual parts and day-to-day decisions about them. Just think about the different parts in your organisation: some of them will sail through with never an issue, and the quality engineers will probably hardly recognise them, whereas other parts will be all too familiar, because they are ongoing problems week-in, week-out. So quality cost is not something uniform to be averaged – it sticks to some parts in very large lumps! An answer to this problem emerged while I was working in two areas trying to predict process capability. In Six Sigma, particularly in Design for Six Sigma (DFSS) the idea is to predict the capability of the final product. 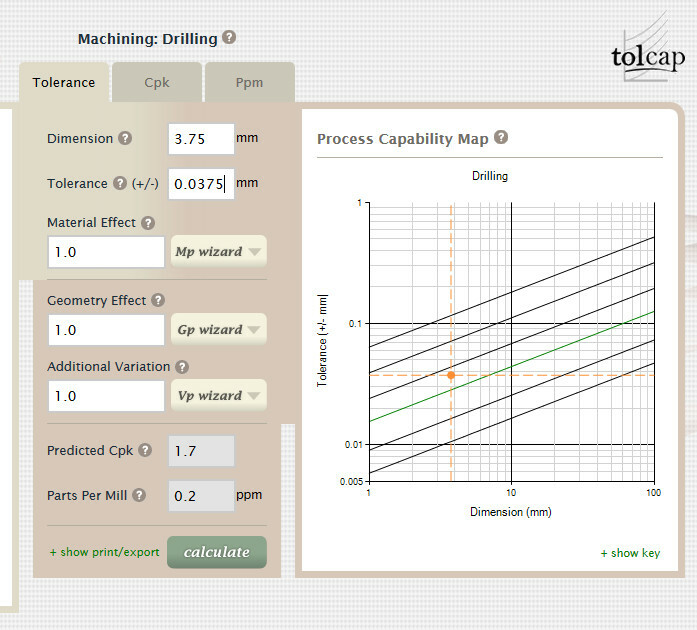 In working towards the development of CapraTechnology’s Tolcap software, we were trying to predict the process capability of parts. This method was described in my article in the Jan/Feb 2010 issue of Engineering Designer (Ref 1). 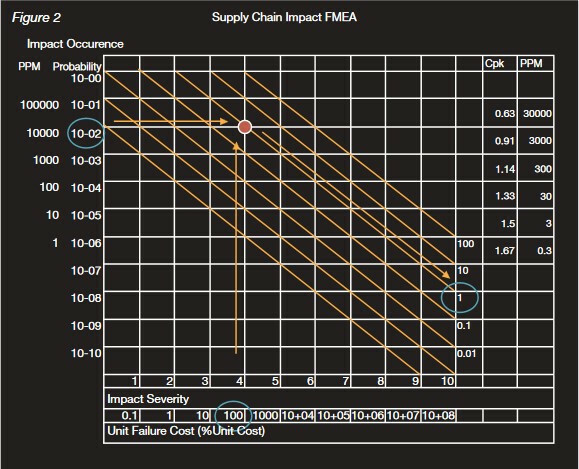 In both these cases, if we can predict process capability, then, maybe we have to assume a distribution, but we can calculate failure rate, failure probability, even the ‘Occurrence’ rating of the defect for FMEA, if we want. The link to FMEA started a train of thought. 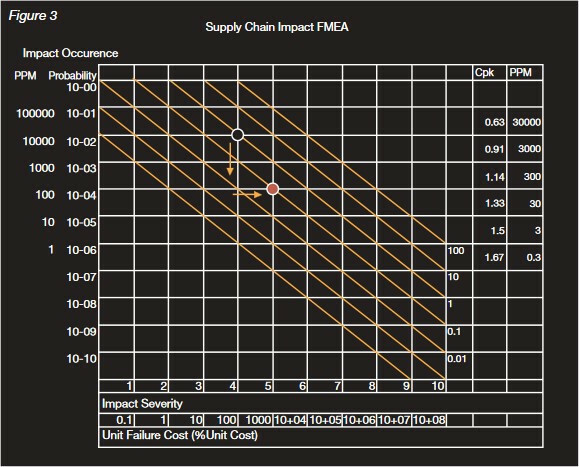 It should be possible to make a small adjustment to the FMEA ‘Severity’ scale, to reflect the traditional ‘rule of ten’ for failure costs (figure 1). As a baseline, if a product is sent straight back by the customer (sometimes called an ‘OE return’), then supplying a replacement plus all the associated administration roughly equates in cost to the sales revenue for the product. If the product has got into the field and then fails, then the warranty cost is ten times as much as for the instant return, given shipping costs and investigation into causes etc. Moving back through the process, reworking a product found to be defective just before it is despatched might well incur a cost of 10% of the value of the product. Taking a 1% probability of an OE return as an example, we can plot a graph of the occurrence versus the severity. Using a log-log scale means it is easy to plot sloping ‘isocost’ lines on the graph. Reading the isocost line confirms that the quality cost of this problem is 1% of sales (figure 2). So if 1% of units were OE returns, quality cost would be 1% of sales. Taking another example, consider a different fault: Its occurrence is one hundred times less probable but it will result in a later warranty problem rather than an immediate OE return. Each fault will cost ten times as much (figure 3). 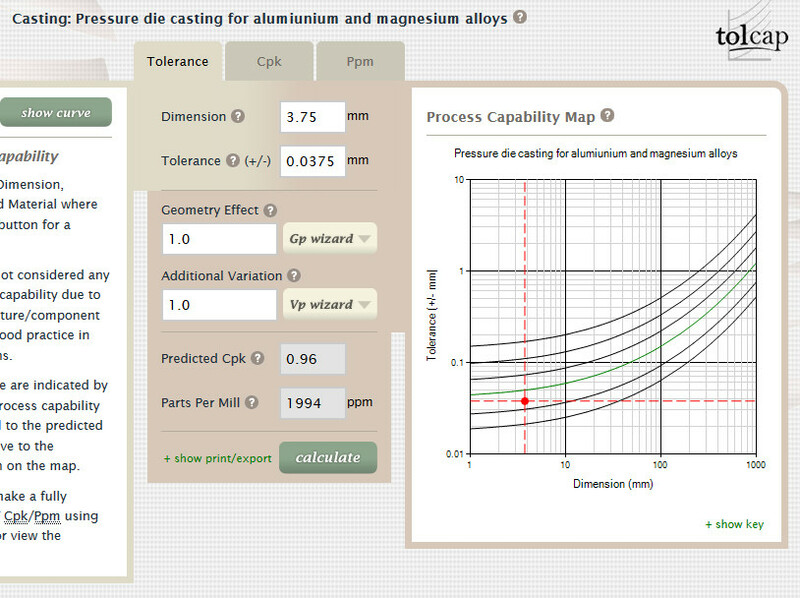 But the importance of process capability prediction extends beyond the design department to the whole company: well it would do since it is design that has by far the greatest influence on product costs. Studies show that nearly half of the problems encountered in production are to do with design for manufacture or production variability - that is process capability problems. The costs of the problem can be very high - consider the problem above and the costs involved - not just the rework or remanufacture of samples, but also the time and effort of quality engineers and designers, who should be completing the design of the current product and getting on with the next generation. In our training we suggest these costs may run to 20% of sales, and we believe they can be even higher - hence the title of this article! So compared with the previous example, the quality cost of this problem is ten times less (0.1% of sales). We can readily plot any fault on the graph and read its effect on quality cost. Now these costs are not offered as accurate to three places of decimals, but if the figure is to be challenged, then data to support a better figure is needed, and the organisation is on a course to evaluate design alternatives more rationally. Do note, by the way, that this cost model represents only the monetary losses; it does not allow for potentially ruinous damage to the supplier’s reputation, or brand image. The points in the examples are towards the top left of the graph, but what about the bottom right hand corner? It is difficult to put a cost on high severity failures, breach of statutory requirements or product liability cases. Enquiries of insurance cover requirements for various potential liabilities directed the impact severity scale. 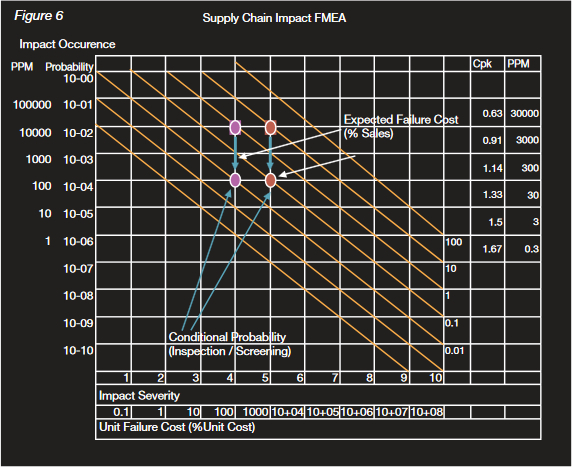 The isocost lines verify that we need extremely low probabilities of failure, way below the FMEA scale. A moment’s practical engineering thought discards the possibility of a single design characteristic with such a low failure rate: even if it were achievable, how could it be demonstrated to be that capable? But, calling on reliability design principles, suppose we have a redundant design with two, independent characteristics guarding against a failure mode, then we can multiply the two failure rates to get the failure rate of the combination. If two characteristics each have 30 PPM (parts per million) failure rates, the probability that both will fail is one in a billion (1 in 10-9). The final step in the assembly of a product selling for £100 is to fix a lid on the cast case with eight 4mm self-tapping screws. It is suggested we save 4p by having the screw holes cast in, instead of having them drilled in a separate operation. 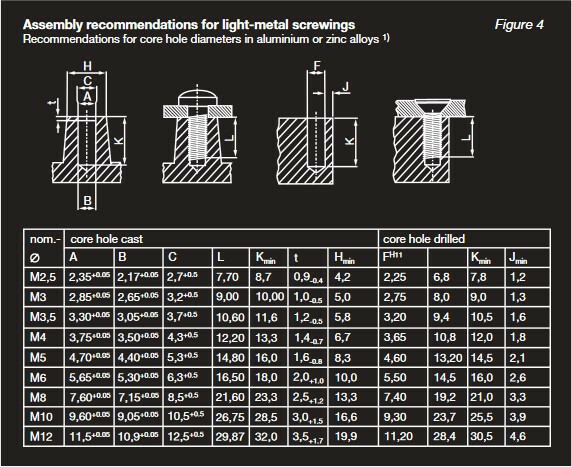 The data sheet for the screws (figure 4) suggests a tapered core hole, diameter 3.75 + 0.05, -0. Interestingly the H11 tolerance for a drilled hole is +0.075, -0, which is more generous! We put 3.75 +0.05 on the drawing, but let’s assume we can get away with +0.075 as for drilling. and that’s 1994 PPM out of tolerance for each screw. With eight screws, that means 20,000 PPM or 2%. Assume 10,000 PPM are too big and 10,000 PPM too small. If the holes are too small, screws shear in 1/100 assemblies when they are driven in (we can allow for this by dropping the occurrence two squares on the graph). This is the last operation, and we lose virtually the whole value of the product. If the holes are too big, a screw will work loose and 1/100 products will leak and be returned under warranty. The graph (figure 6) shows the costs are £0.01 + £0.10 = 11p – at best, but remember Murphy’s Law, and we might get more loose screws than we thought! So we save 4p by not drilling. However, the question for the organisation is: who pays the 11p quality cost? In conclusion, cost of quality is important in understanding total cost, and therefore in choosing the better design alternative. If we can predict process capability (as Ref. 1) and assess the impact of being out of tolerance then we can estimate a quality cost. Then alternative designs and processes can be compared directly on a total cost basis, and we can have better discussions with our colleagues and our suppliers. Batchelor R, and Swift KG, Capable Design, Manufacturing Engineer , December 1999.